Yulee, FL – Springer Controls, in partnership with Tecno Elletrica Ravasi of Italy now offers explosion proof pendant controls certified by IECEx and ATEX for installation in zones 1, 2, 21 and 22. This allows them to be used in environments where combustible gasses and dusts are likely to be found during normal operation. Two different explosion proof pendant controls are available depending on your preference. The Mike-X explosion proof pendant is a single column design that can be equipped with 4-16 actuators including buttons (illuminated and non-illuminated), e-stop, and selector switches both keyed and unkeyed. It comes complete with 2 speed switches, with all NC contacts positive opening for safety. The Mike-X is also rated IP65 making it dust and water tight, and rated for use in temperatures from -20° to +60°C (-4° to +140°F) allowing it to withstand your toughest job site requirements. The SPA explosion proof pendant is a double column design which allows for a large number of operators in a compact control unit. The SPA pendant can be equipped with 2-12 operators with either single speed or 2 speed switches. The IP66 rating and extreme temperature resistance; -50°C to +55°C (-58°F to +131°F) make it suitable for nearly any environment on earth. Springer Controls is a full-service electrical controls manufacturer with a UL-508A approved panel shop carrying high quality IEC components and an extensive mix of electrical industrial control products manufactured by Springers partners. 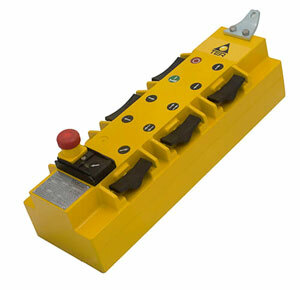 Springer stocks rotary gear limit switches and pendant controls from Italian manufacturer TER. Springer also carries temperature controls for transformers from Tecsystem in Italy. Disconnect and CAM switches from Merz in Germay, motor control and protection from Fanox in Spain and stack and dome lights from Texelco in Italy round out the diverse products that Springer provides to OEM and end user clients across North America. Contact us today for any questions you may have on your industrial controls applications.